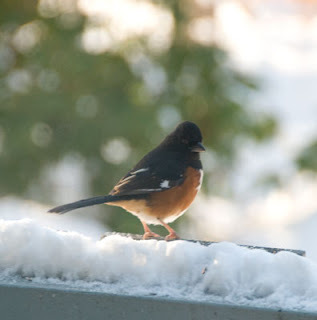 In many parts of the U.S the American Robin is the harbinger of spring. But for This Traveler the robin is steadfast winter friend, more visible now than at any time of year. In late autumn the robins begin forming huge flocks that live deep in the woods. This is a sight to behold. I have walked in the woods amongst hundreds of robins who have nearly landed on me in their excitement to find the best roosting spot. 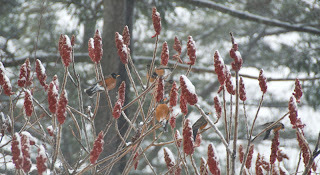 When it snows, one particular flock takes over the sumac grove in my backyard and there the robins flit and flutter and shred the blossoms of the sumac tree. They sit in the surrounding trees, their rust red breasts looking like faded fall fruit. 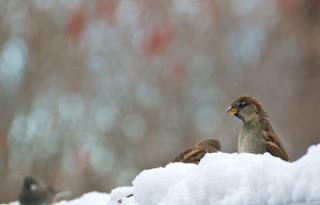 And sometimes they line up like good little soldiers along the rain gutters, gulping down snow melt. 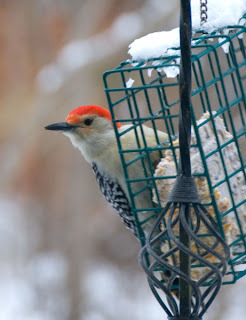 This year, along with the robins, I have a plethora of crows, blue jays, starlings, cardinals, juncos, house sparrows, white throated sparrows, gold finches, downy woopeckers, hairy woodpeckers, yellow-shafted flickers, and, of course, my pair of red-bellied woodpeckers. The "nine ladies who brunch", the wild turkeys, come regularly around 9 am, looking for all the world like miniature velociraptors. That the male turkey, who shows up on occasion, is brave enough to approach this fearsome bunch never ceases to amaze me. 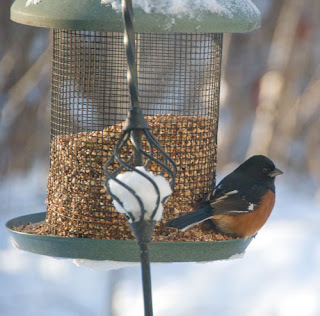 This winter has also brought a new visitor to my bird feeders, a rufous-sided towhee. 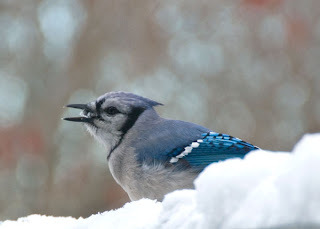 These marvelous songsters are ever-present in the spring underbrush but this is the first time one has become brave enough to visit my deck, let alone the bird feeder, in winter. 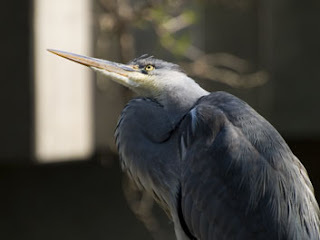 You put WHAT in the birdfeeder!? !